Last week, I suggested that the April 15th “tea parties” were an indication of the potentially increasing influence of libertarianism within the Republican Party, and noted that attendance at the tea parties had been higher in states (such as New Hampshire and the Mountain West) that are traditionally associated with having libertarian leanings. But I didn’t present any evidence in support of that claim — and so, here it is. The best benchmark I’ve been able to come up with for libertarianism is the amount of contributions to Ron Paul’s 2008 presidential campaign. Fundraising data has the advantage of being extremely clean and comprehensive — all contributions of at least $200 are reported to the FEC and itemized by their location. 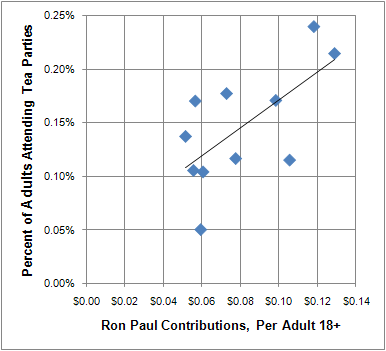 Here, then, were Ron Paul’s best fundraising states, as measured by contributions per adult aged 18+. What do we have here? We have New Hampshire, we have Texas (where Paul is from) and we have a whole bunch of states in the Mountain West. Per capita, Paul raised about twice as much money in the West as he did in other parts of the country. In New Hampshire, he raised about three times above the national average (although we should disclaim that New Hampshire has an early primary and is generally a good fundraising state for all Presidential candidates). As measured on a per capita basis, eight of the top ten states for Tea Party attendance were West of the Mississippi. Five of the top ten — Alaska, Arizona, Colorado, Idaho, Wyoming — overlap with the best Ron Paul fundraising states. New Hampshire, incidentally, had 0.21 percent of adults attending, placing it 14th out of the 50 states. Note that the three Western regions — Big Sky, Southwest, Pacific — occupy the top three slots, followed generally by the South, the Northeast and the Midwest. The correlation (.65) is not perfect but is nevertheless fairly strong. The major exception is in the South, where there was proportionately attendance at the tea parties than there was enthusiasm for Ron Paul. What we seem to have is an audience that was about two parts Ron Paul/libertarian conservative (with its strength out West and in New Hampshire) and one part Sarah Palin/red-meat conservative (with its strength in rural areas, particularly in the South). This is perhaps not an accident, since Paul and Palin are just about the only Republicans to have generated some real grassroots enthusiasm over the past few years. And yes, before anyone asks, I do think the tea parties were a relatively “authentic” display of conservative grassroots activism. Certainly, it helps the cause when you have FOX News advertising on your behalf. But FOX News can’t get you up off your couch, nor — when a protest is being conducted simultaneously in several hundred different locations — can they tell you exactly where to go. For that, you’d have had to talk to your neighbors or log onto the Internet, which is what the tea-partiers did. Now, I also think the tea parties got more attention than they deserved, especially in comparison to things like anti-war protests of 2003 or the immigration rights protests of 2006, which had much larger aggregate attendances. Nor were they particularly representative of where the country is at as a whole. On the contrary, record numbers of Americans think they’re paying a fair share of taxes. But I do think this was one of the right’s more effective moments of late, particularly if regarded as a sort of “fire drill” for 2010 and 2012. If the right somehow could fuse the enthusiasm of the Palinites with that of the Paulites — and that isn’t necessarily going to be a happy marriage — they’d have the makings of something that could help to rebuild their damaged coalition.